One of FiveThirtyEight’s goals has always been to get people to think more carefully about probability. When we’re forecasting an upcoming election or sporting event, we’ll go to great lengths to analyze and explain the sources of real-world uncertainty and the extent to which events — say, a Senate race in Texas and another one in Florida — are correlated with one another. We’ll spend a lot of time working on how to build robust models that don’t suffer from p-hacking or overfitting and which will perform roughly as well when we’re making new predictions as when we’re backtesting them. There’s a lot of science in this, as well as a lot of art. We really care about the difference between a 60 percent chance and a 70 percent chance. That’s not always how we’re judged, though. Both our fans and our critics sometimes look at our probabilistic forecasts as binary predictions. Not only might they not care about the difference between a 60 percent chance and a 70 percent chance, they sometimes treat a 55 percent chance the same way as a 95 percent one. I don’t want to make it sound like we’ve had a rough go of things overall.1 But we do think it’s important that our forecasts are successful on their own terms — that is, in the way that we have always said they should be judged. 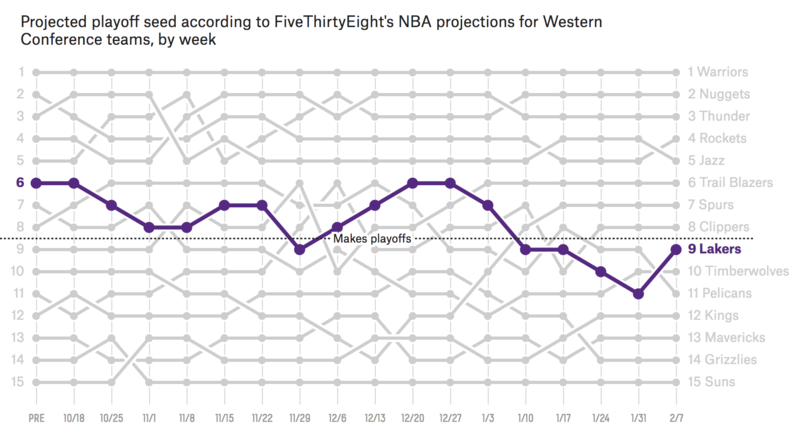 That’s what our latest project — “How Good Are FiveThirtyEight Forecasts?” — is all about. That way is principally via calibration. Calibration measures whether, over the long run, events occur about as often as you say they’re going to occur. 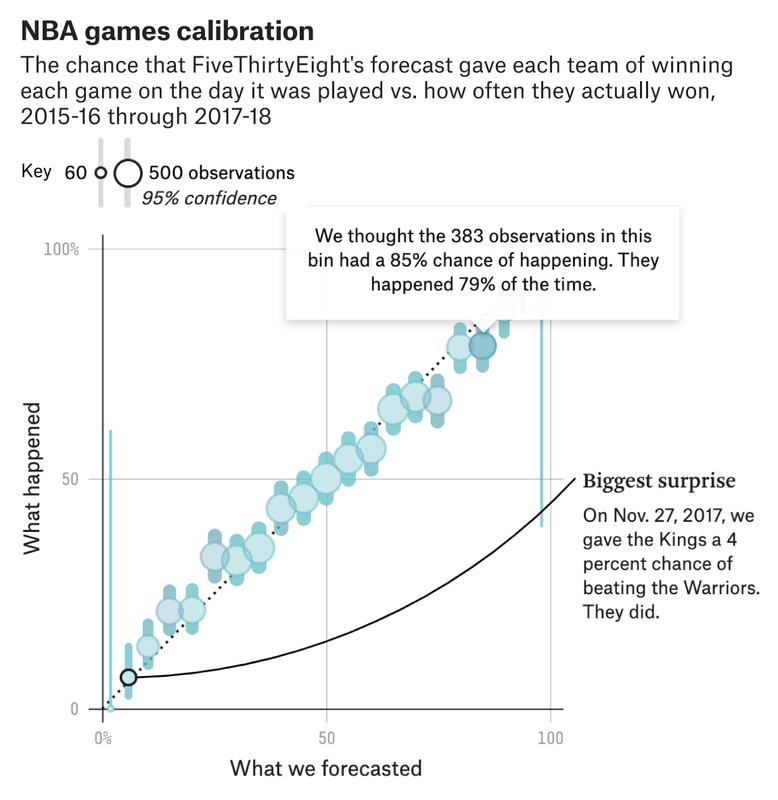 For instance, of all the events that you forecast as having an 80 percent chance of happening, they should indeed occur about 80 out of 100 times; that’s good calibration. If these events happen only 60 out of 100 times, you have problems — your forecasts aren’t well-calibrated and are overconfident. But it’s just as bad if they occur 98 out of 100 times, in which case your forecasts are underconfident. The catch about calibration is that it takes a fairly large sample size to measure it properly. If you have just 10 events that you say have an 80 percent chance of happening, you could pretty easily have them occur five out of 10 times or 10 out of 10 times as the result of chance alone. Once you get up to dozens or hundreds or thousands of events, these anomalies become much less likely. But the thing is, FiveThirtyEight has made thousands of forecasts. We’ve been issuing forecasts of elections and sporting events for a long time — for more than 11 years, since the first version of the site was launched in March 2008. The interactive lists almost all of the probabilistic sports and election forecasts that we’ve designed and published since then. You can see how all our U.S. House forecasts have done, for example, or our men’s and women’s March Madness predictions. There are NFL games and of course presidential elections. There are a few important notes about the scope of what’s included in the footnotes,2 and for years before FiveThirtyEight was acquired by ESPN/Disney/ABC News (in 2013) — when our record-keeping wasn’t as good — we’ve sometimes had to rely on archived versions of the site if we couldn’t otherwise verify exactly what forecast was published at what time. What you’ll find, though, is that our calibration has generally been very, very good. For instance, out of the 5,589 events (between sports and politics combined) that we said had a 70 chance of happening (rounded to the nearest 5 percent), they in fact occurred 71 percent of the time. Or of the 55,853 events3 that we said had about a 5 percent chance of occurring, they happened 4 percent of the time. Our forecasts of elections have actually been a little bit underconfident, historically. For instance, candidates who we said were supposed to win 75 percent of the time have won 83 percent of the time. These differences are generally not statistically significant, given that election outcomes are highly correlated and that we issue dozens of forecasts (one every day, and sometimes using several different versions of a model) for any given race. But we do think underconfidence can be a problem if replicated over a large enough sample, so it’s something we’ll keep an eye out for. It’s just not true, though, that there have been an especially large number of upsets in politics relative to polls or forecasts (or at least not relative to FiveThirtyEight’s forecasts). In fact, there have been fewer upsets than our forecasts expected. There’s a lot more to explore in the interactive, including Brier skill scores for each of our forecasts, which do account for discrimination as well as calibration. We’ll continue to update the interactive as elections or sporting events are completed. None of this ought to mean that FiveThirtyEight or our forecasts — which are a relatively small part of what we do — are immune from criticism or that our models can’t be improved. We’re studying ways to improve all the time. But we’ve been publishing forecasts for more than a decade now, and although we’ve sometimes tried to do an after-action report following a big election or sporting event, this is the first time we’ve studied all of our forecast models in a comprehensive way. So we were relieved to discover that our forecasts really do what they’re supposed to do. When we say something has a 70 percent chance of occurring, it doesn’t mean that it will always happen, and it isn’t supposed to. 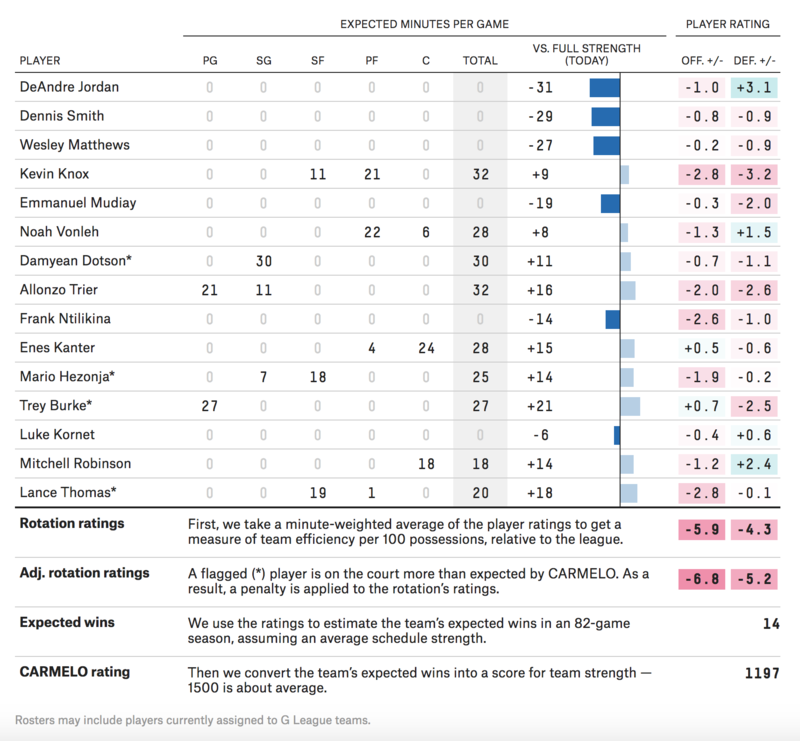 But empirically, 70 percent in a FiveThirtyEight forecast really does mean about 70 percent, 30 percent really does mean about 30 percent, 5 percent really does mean about 5 percent, and so forth. Our forecasts haven’t always been right, but they’ve been right just about as often as they’re supposed to be right. Why Are There So Many Bats At Spurs Games? There are a few things we’ve come to expect over the years from San Antonio Spurs basketball. The team will always find a way to make the playoffs, no matter how much talent and pedigree it loses during the offseason. Coach Gregg Popovich will generally deliver grumpy end-of-quarter interviews no matter how well his team is playing. And once in a while, we can expect a furry, winged menace to descend from the rafters and terrorize their home court. The local bats of San Antonio have long held a reputation as unruly Spurs fans, occasionally crashing games and disrupting play. In recent weeks, though, the bats have claimed season-ticket holder status with the red-hot team, which has won six-straight contests. In three of the team’s past six home games, including this past Sunday, one of the flying mammals has brought a Spurs’ game to a screeching halt for minutes at a time, as various team staffers furiously scrambled to apprehend the flapping intruders. All of which raises the obvious question: Why is the arena plagued with bats so often? What’s more, it’s logical that bats would fly past the arena, particularly during the winter months. 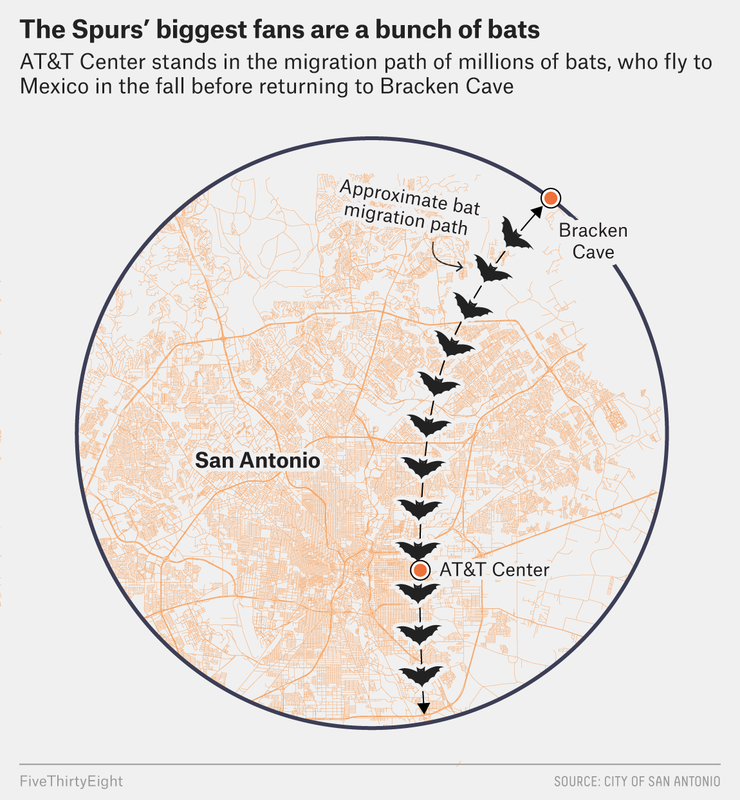 The stadium is almost directly in the bats’ migration path from Central America and Mexico back to Bracken Cave, where maternal colonies fly to have and nurse their newborns (nearly doubling in number). Still, the team’s proximity to the real-life Batcave alone doesn’t explain how the bats are working their way inside the venue. There are a couple of potential factors at play. First, the San Antonio arena — a few miles outside of the city’s downtown area and adjacent to a golf course — is perhaps the closest thing to a suburban venue in the entire NBA. The massive, brightly illuminated presence that attracts moths and other insects in an otherwise quiet area might be appealing to bats5 that are looking for food on a given night, according to Judit Green, who has worked as an urban wildlife biologist for 30 years with the Texas Parks and Wildlife Department. Once a bat does make it into the arena, we’ve seen time and time again what type of hilarity may ensue. It was nearly a decade ago in 2009 — on Halloween, fittingly enough — that future Hall of Famer Manu Ginobili endeared himself to Spurs’ fans even more by swatting a disruptive bat out of the air with his bare hand. To be clear, the AT&T Center isn’t alone in producing odd animal-related headlines. It’s nothing new for pro sports, particularly ones played outdoors, to be interrupted by uninvited animals like squirrels, cats, birds, bugs, dogs and rabbits, just to name a few. And bats have also popped up once each this year at NBA games in Utah and Indiana, respectively. But the San Antonio arena has developed a reputation for general weirdness over the years. Aside from a pigeon that flew overhead at the arena in early January, a snake was found in the visiting locker room before a playoff game between the Blazers and Spurs in May 2014. A month later, during Game 1 of the NBA Finals, the air conditioning stopped working — a development that became controversial after visiting star LeBron James cramped, shifting the momentum of the contest away from Miami and toward San Antonio. The Spurs went on to dominate the series, and James left the Heat the following month in free agency. While the team did hire a designated pest-control expert following the Ginobli incident, the little-desired task of removing the bats usually falls to arena staffers who just happen to be on the court — and needless to say, it doesn’t always go so well. A handful of Spurs’ employees often give unsuccessful chase to bats, usually armed with nothing more than towels. Even Coyote, the team mascot, has gotten in on it — and, in a few cases, has actually been the one to round up the bats, illustrating just how much of an all-hands-on-deck process it can be. Rob Wicall, who served as the mascot for nearly two decades before stepping down in 2016, sounded almost envious of all the bat run-ins there have been lately. For years, well before Ginobili’s bat-swat back in 2009, Wicall kept a fishing net he’d bought and the mascot’s Batman costume accessories nearby,6 just in case a bat ever got loose in the arena. Ginobili took care of the problem just before Wicall could suit-up and come to the rescue back in 2009. But during his farewell season, Wicall got another chance to be the hero before a game in December 2015, and he made it count. He couldn’t see that well — the costume allows little to no peripheral vision — but he tracked the bat into the painted area before somehow nabbing it with his net. When he realized he’d succeeded, Wicall — in Coyote’s full Batman attire, with the PA announcer playing the old-school Batman theme song over the speakers — lifted his arms triumphantly. “It was one of those bucket-list things for a mascot, because you’ve not only solved a problem in the arena, but you’ve also brought entertainment,” said Wicall, adding that it took him less than 45 seconds total to dash into his changing area and throw on Coyote’s Batman accessories. But not everyone relishes these run-ins. Spurs forward Rudy Gay sought shelter from a bat by hiding behind ref Zach Zarba last month. And Nets All-Star guard D’Angelo Russell, who has now had two separate bat experiences at AT&T Center the past three seasons, took refuge in the tunnel leading to the locker room as four bats circled over the court. Bucks center Brook Lopez, on the other hand, would activate a Bat Signal if he could. As a comic-book aficionado, Lopez told SB Nation early in February that he’d welcome being bitten by a bat in hopes that it might make him a superhero. Fate seemed to be listening. A bat flew past Lopez on Saturday in San Antonio. Fortunately — or perhaps unfortunately, given Lopez’s hope of becoming a superhero — he wasn’t bitten. The idea that Harden is what Taylor called a “Scoring Nash” is eye-opening. 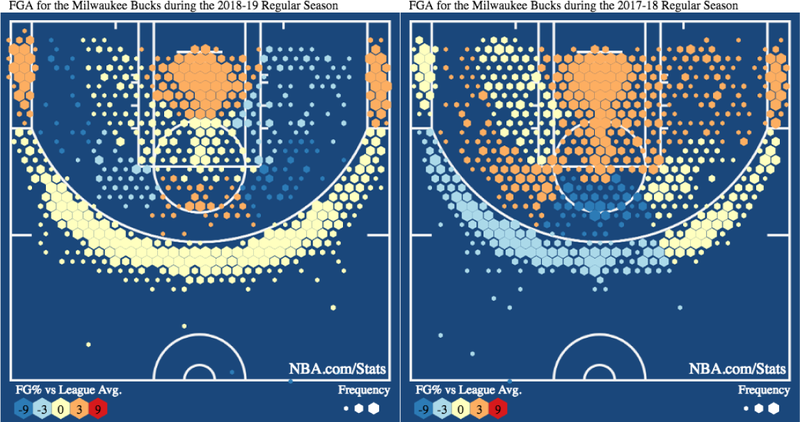 Playing in a similar (if not exactly identical) system to the one Nash orchestrated for four years under coach Mike D’Antoni, Harden has evolved the role of distributor to include an even greater level of player choice. If one of Nash’s great strengths was drawing defensive attention as a means of setting others up for easy shots, Harden can also use the threat of the pass as a means of giving himself more space to shoot. 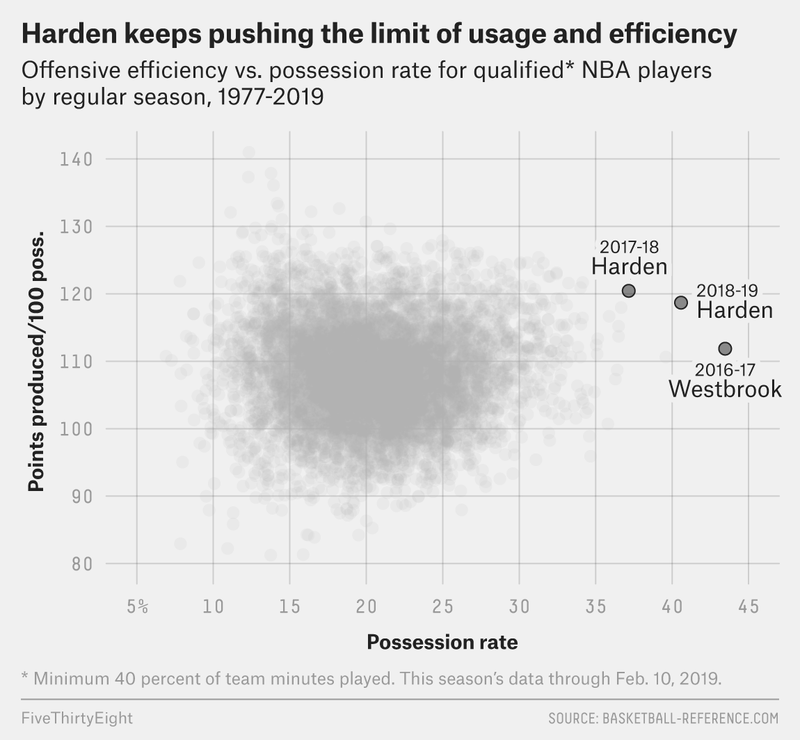 As a result, Harden has an “offensive load” — Taylor’s metric for measuring direct involvement via scoring or passing within an offense — of 66 percent, compared with Nash’s single-season high of 51 percent under D’Antoni in 2007. 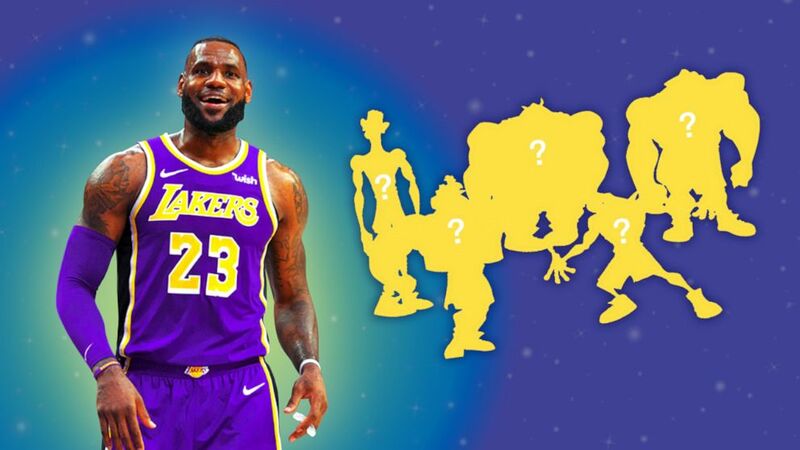 Posted on February 1, 2019 Categories CampaignsTags Dallas Mavericks, Dennis Smith Jr., Kevin Knox, Kristaps Porzingis, NBA, New York Knicks, Tim Hardaway Jr.